No running water, tuberculosis, dengue fever, crime gangs, - these are a few of the words that describe the community of Nueva Suyapa, a place we have called home since 2004. 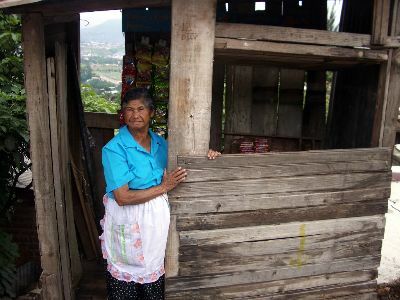 Built on the city dump after Hurricane Fifi in 1974, Nueva Suyapa is one of the poorest communities in Honduras. A maze of steep rutted dirt roads and small tin roofed shacks, the community is one in which more than 70 percent of the children live in poverty. What we used to take for granted - bathrooms, running water, and safe streets - have become issues we work on for a community of over 35,000 people. While we have chosen to live in a community of gangs, crime, and horrible injustices for the poor and marginalized, we have also been able to see the Hope of Jesus in a place that seemed forgotten. In 2003 Maureen was diagnosed with cancer. After major surgery and a clean bill of health we decided that life was short and we should change course for a season. We quit our jobs (Chris was president of a large promotional company and Maureen was CEO of her own social services consulting company), sold our cars, put our stuff in storage, and moved into one of the most dangerous communities known to Honduras. We chose to work under the Christian non-profit called Servant Partners where we could incorporate our business and community development skills. Chris uses his business skills to help create small businesses by teaching the basics of writing business plans, budgeting, and actually helping with the development of micro loan development for new and emerging businesses. He helped create the first "Commercial Center" in the slum where we live which houses 6 new businesses including a Fitness Center, Pizzeria, Internet Cafe, Copy Center, Dry Goods Store, and Office Rental Space. Maureen helped start a non profit called Honduras Puerta al Mundo that is sending Hondurans to work in places like North Africa and India. Through the organization we have partnered with other NGO's to improve education and social services in marginal areas as well as provide leadership development and training to those working in marginal areas throughout the world. We have no illusions. Water turns on every 20-30 days, children are in school less than 4 hours a day, some of the most dangerous gangs start from within our community, the average wage is less than $100/month, and families often send their children begging to the streets to help put food on the table. Yet there is hope. Micro loan development, leadership training, financial and economic skills, and educational support are just a few of the areas that we have been able to make an impact. In 2005 we helped open a commercial center which houses 6 businesses and has become a business incubator for new and emerging businesses. We have partnered with Christian churches throughout the country and started a non profit called Honduras Puerta al Mundo, where Hondurans receive training and leadership development to be leaders in their own country as well as abroad in some of the poorest countries in the world. While challenges and poverty exist, we known that God has put us here for this season to be a "light .on the hill" - literally. Through God's amazing grace, He also blessed us with our amazing daughter, Genesis Abigail "Abby", born March 24, 2005. She is the light of our lives. We never knew how God would bring together all the pieces of our past experiences, joys, and trials, but He continues to show us that He is a God who loves justice and loves the poor. We are honored to be a part of His work in Honduras. 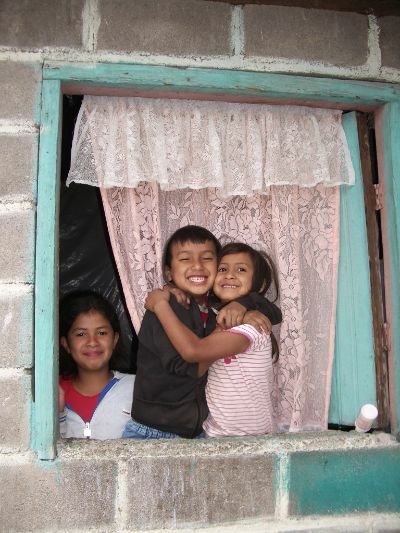 We want to provide you with information on our life living and working in the slum community of Nueva Suyapa. The emphasis of our site is to share the experience with our friends and family. Jersi, Aleyda and Carla are three of our favorite kids that live next door. 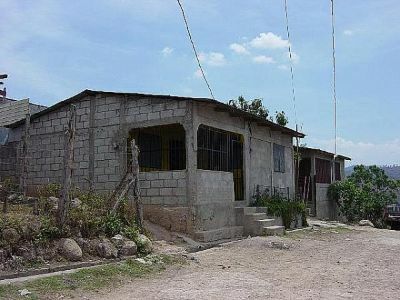 This is Home Sweet Home for us in Nueva Suyapa. We do not have running water, a bathroom, nor sink inside the house. We do have a small pila (water tank) and the water turns on for a few hours every 20 days or so....... In front of our rented house is a gutter where sewer water often flows. The best thing about our house is that there are always tons of kids for Abby to play with. 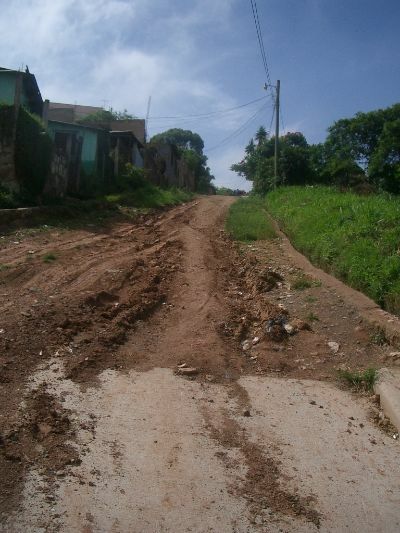 The roads are unpaved and steep and are incredibly muddy at times. It sure makes life interesting! This is where we get off the local bus to walk home. It is always entertaining to watch cars try to go up and down this road. This is a friend of ours who runs a small stand that sells crackers and cookies. As you can see it is not much, but this is how she makes a living. We have recently moved back to California, but are still activly involved in Nueva Suyapa Honduras. Please contact Maureen at bigbrightidea@yahoo.com on how you can help make a difference in Honduras.